Typically, pedestrians share the same area with moving vehicles. Often, distracted drivers focus on the hunt for an empty space instead of paying attention to pedestrians. Adding sidewalks between the noses of vehicles removes pedestrians from the dangerous roadway area so they can safely transition from their cars to the building. As an added benefit, raising the walkways at crossings to the surrounding areas eliminates a step up or step down making the pedestrian walkway universally friendly while effectively slowing vehicular traffic. In certain cases it may be necessary to lower all the walks approaching an intersection. At these points, longer slope transitions and curbs back to grade can be installed to eliminate the handicap ramp look and feel at the intersection. Vehicles drip grease and other environmental contaminants. When mixed with stormwater, it creates hazardous runoff. Bio-swales are a green filter that, when properly designed, add a park-like experience to a parking lot while serving to reduce the number of harmful chemicals entering the ecosystem. Bio-swales should be carefully designed and built, as the soil mix must have proper drainage characteristics and the plant species must be appropriate for this application. Around the holiday season, retailers need extra parking; the rest of the year, most have unnecessary pavement. For big-box retailers and other large parking generators, cities across the nation have begun establishing parking maximums and eliminating parking minimums. Some cases require additional parking spaces be provided in some sort of permeable paving. Permeable pavement allows water to percolate through the surface into the soil below rather than simply run off. However, these spaces still provide a solid surface for cars and pedestrians. Drivers tend to select shaded spaces, but large trees need large green areas to grow. The addition of larger tree islands gives plants the soil they need to expand and creates safer vehicular movements. In a perfect parking lot, each space would not only be safe and secure but also shaded and with easy access to the destination. Drivers want to exit their cars without stepping in a puddle of mud. They need enough space to avoid hitting other vehicles, as well as a safe pathway from their car to the facility. Adding larger green spaces helps protect the driver, the pedestrian, and the environment. Parking lots do not typically add to the beautification of a city. Adding plants can serve as a great benefit when done properly to avoid possible issues. For example, selected plants must fit the site and its growing area. All too often, a plant that looks great in a 5-gallon container grows to be 12’ tall and 12’ feet wide. In the wrong place, such as near an intersection, this could impede sight lines creating a safety hazard. Careful plant selection and placement based on the exact location, climate, soil, and growth habit are crucial to a safe parking lot. Most project sites do not have an amusement park budget, nor do they require amusement park design. Using native and adaptive plantings on a project means that most shrubs and trees will not require extensive pruning into topiary shapes. When placed correctly, it could be years before they need pruning, which reduces long-term maintenance costs. Across the region, municipalities continue to work toward improving parking lot ordinances to create better spaces to serve the people, environment, and vehicles. 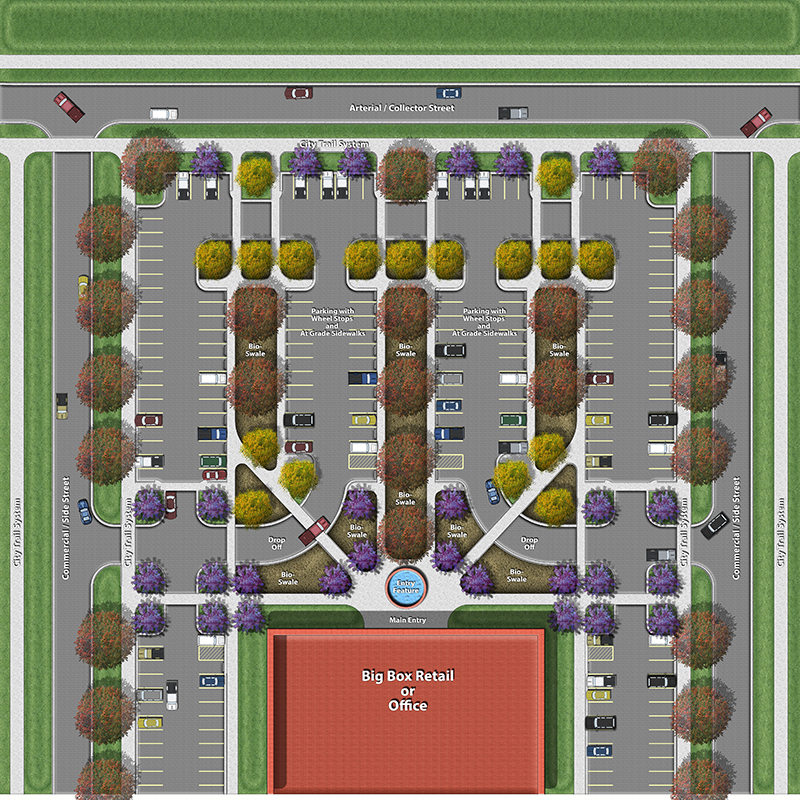 Landscape architects, working in unison with civil engineers, create spaces that emphasize function, safety, aesthetics, and ecology all in one parking lot.